I would suggest doing a "Save Page As" under your Save button. This will replicate your pages, instead of having to keep copying and pasting. If you use the save as option you can make as many replicates without having to add the same code over and over. 2. To the right of the save button is an arrow. 3. 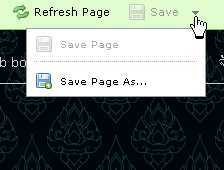 Click that and the option "Save page as" will be seen. Select this. 4. 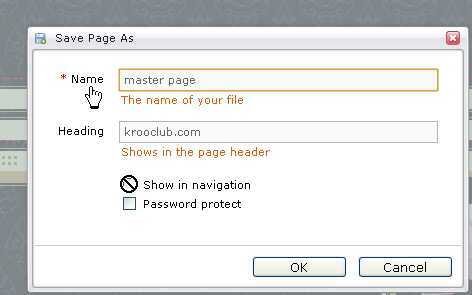 Type a name such as "master page"
5. Deselect "Show in navigation"
You can then open "Master Page" and tailor it to your new page requirement then again use the "Save as" function to give it the name of your wanted new page. "MasterPage" will stay in the menu slections and you can simply do the same thing whenever you want a new page with the same features. Good idea with the Save As! That comes in very handy! its a brilliant idea but what about my existing pages? This won't affect any existing pages only pages that you are yet to create. There's nothing that will automatically allow changes to existing pages Alex. Have a look at what you have done and ask yourself whether it's worth deleting the old pages and replacing them by using this option or leaving them and possibly copying code from your original and pasting into the other pages. Your existing pages will not be altered Alex. It's like making another copy of your page but with a new name. Everything will be the same until you start tweaking it again to your liking. but is there a way to make 5 codes into 1 with all the individual codes next to each other? but you need to know what your looking at when reading the html..
your best plan is to use save as - then change the code on each page - you will only need to do it for the main pages maybe 4- 8 times depending on the amount of nav pages you have. sorry, somtimes i dont fully read posts or replys! i will try the save as, thing, i have made my finishing touches to my nav menu, not to be edited again! do you likewhat ive done with the tables and the hover text codes you gace me? im glad you liked the NAV BAR, i spent about 2 hours on it today!